A mother-of-three who became a sugar baby while fleeing an abusive relationship insists that she will support her children if they one day decide to follow in her footsteps — but she is making sure they will never financially need to do so. Samantha, 24, from Tuscon, Arizona, is one of the the fifteen finalists in the 2017 Sugar Baby of the Year contest hosted by Seeking Arrangement, a dating site that pairs attractive young women with wealthy older men who will financially care for them. 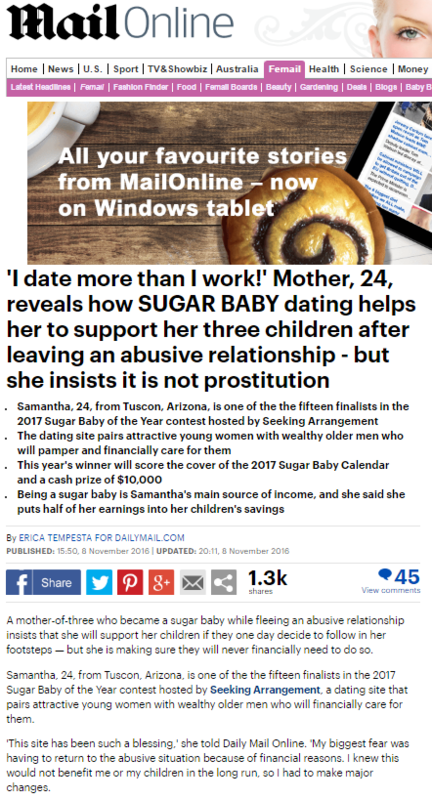 That’s right, it’s yet another advert in the Daily Mail for ‘Sugar Daddy dating’ website Seeking Arrangement – the website whose business model is almost indistinguishable from prostitution, yet who never struggle to get the Daily Mail to publish 1200 words and a dozen soft-core photos by way of promotion. This entry was posted in Seeking Arrangement on November 23, 2016 by Michael Marshall.